Ok so you remember a few weeks ago, I showed you the stack of fabric that I had cut? Well 144 squares and a hand cramp later and this is what I have. 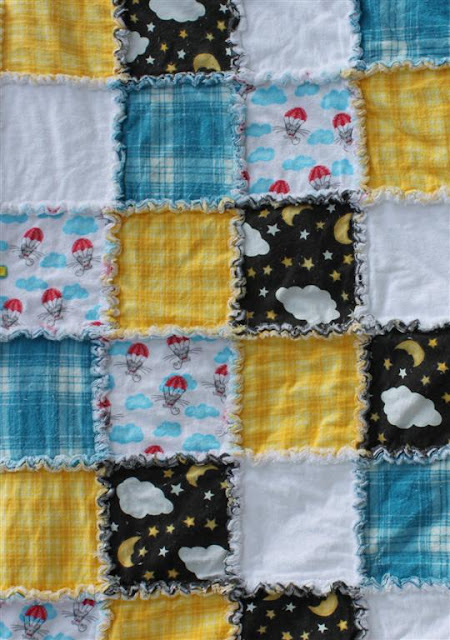 I love this blanket, it is so soft and cozy and perfect for a little boy or girl. Can't wait to wrap my baby up in it!! holy smoke Lydia this is totally INCREDIBLE!!!!! This is just gorgeous! Are those ruffles connecting all the squares - perfect for your little one! Just adorable! I love this... the colors are so great too, very unusual!